It is said that ever since a reform was made to Japan's educational system in 2002, aptitude levels have plummeted. Students who were in school right at that time have gone off into the real world and are being criticized as "lacking in ambition and competitiveness," as well as "lacking in cooperativeness." Society calls them the "yutori generation" (relaxed generation). 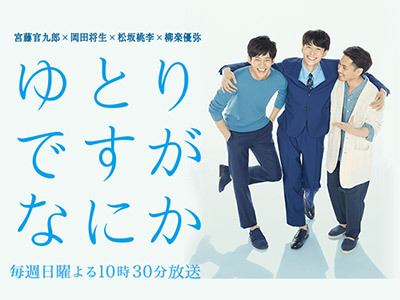 This drama focuses on three young adults who were all born in 1987, the first wave of the "yutori generation." They meet each other through "Rental Uncle," a service that dispatches a middle-aged man to give advice to the younger crowd. Masakazu is your ordinary 29-year-old corporate employee. He studied hard for his college entrance exams and passed on the first try. He was serious about finding a job and eventually got hired by a food manufacturing company. Born into a family of educators, there was never any doubt that Yamaji would become an elementary school teacher. Called by the students as "yutori sensei" (relaxed teacher), Yamaji's students are getting low grades and the mothers are beginning to complain. And then there's Maribu, who was born into an elite family and always got stellar grades and did well in sports, but failed the college entrance exams. Ten years later, Maribu is still trying to get into Japan's top university. A story woven by three young adults and a "Rental Uncle" who at times will make you laugh and at times cry. You'll find yourself completely immersed in this drama that is reminiscent of a challenging survival game!